For over 2,000 years of Buddhism in Vietnam, the famous name of Yen Tu Mountain has been associated with the name and career of Buddhist King Tran Nhan Tong who founded the Truc Lam Zen sect bearing the typical Buddhist culture of the Vietnamese people. This “sacred land” is the “capital” of Buddhism of Dai Viet (the old name of Vietnam). With the unique landscape, architecture, culture and history, Yen Tu Relic and Landscape Complex has been recognised as a special national relic and a dossier is being prepared to submit to UNESCO for its recognition of the complex as a World Heritage Site. Yen Tu Mountain’s beauty is in the harmony between imposing mounts and ancient pagodas and temples lurking under pine forests and bamboo clusters, making tourists relax after trekking sloping roads. If you wonder how to get there, let’s read this one. From Hanoi, tourists can take a motorbike or car for 125 kilometers, passing Uong Bi City then make a turn to Vang Danh Street for about 9 kilometers and finally turning left. There are two ways to reach Yen Tu Mountain’s peak: trekking or taking the cable car. By cable car you travel about 1.2 kilometers to a height of 400 meters above sea level, near Hoa Vien Pagoda, tourists can take a panoramic view of magnificent Yen Tu Mountain. 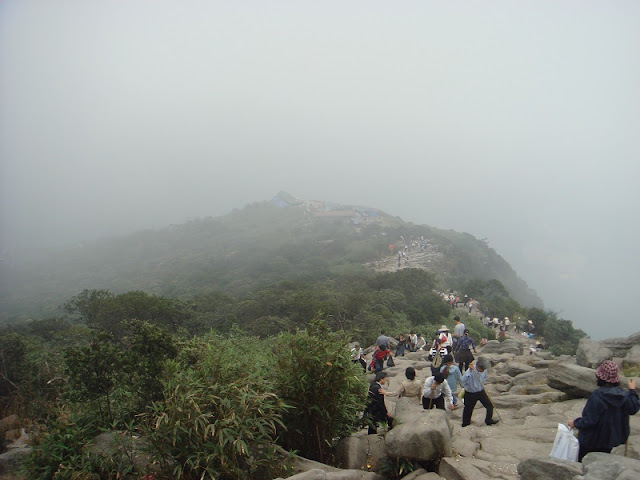 The second route is trekking for about 6 kilometers on stone steps; travelers need good health and good preparation. However, with the shade of immense forest, wild flowers and strange species, it makes the journey more interesting and eases the tiredness. The journey to visit Yen Tu departs from Giai Oan River. The stream water is blue and pure round year. The next destination is Hoa Yen Pagoda nestled on a height of 534 meters which has two frangipani flower trees which are 700 years old. After leaving this site to conquer the peak, you can stop at some other sites such as To Tower, Mot Mai and Bao Sai pagodas, Yen Ky Sinh stone statue and Ngoa Van Temple.